Mrs. White's PM Kindergarten class visited the Write Place computer lab in April and graphed data about their favorite fruits. They came to the lab with drawings of their favorite fruit. Students chose one fruit among four - apples, oranges, bananas and strawberries. 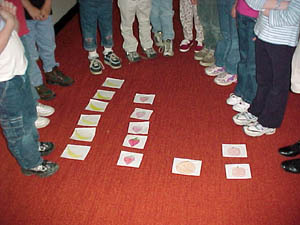 When the students arrived in the lab they made a graph on the carpet using their pieces of paper. We talked about the graph and how many students like each fruit. The students filled in the data table prepared for them with the numbers for each fruit. 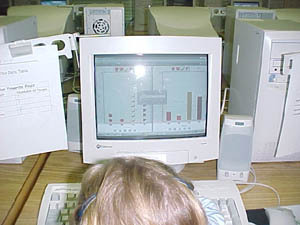 Then it was time to make their graphs on the computer from the data table they completed. The students did an excellent job making graphs using Graph Club software. They had absolutely no problems changing the default symbols in the graphs from pets to pictures of fruit. What super computer users they are! They were able to label the axes and give their graphs a title when they printed their graphs. Each student left the lab with a very nice copy of their hard work. We are so proud of them!